The Stompa Rondo 6 has been slightly re-styled, the ladder is now all one colour (either antique or white) and the cubed storage compartment now have doors rather than drawers. 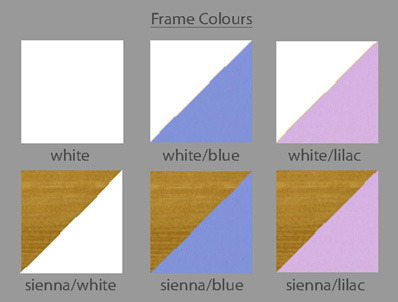 The cabin bed is available in 6 colour ways with combinations of white, blue, lilac and antique. 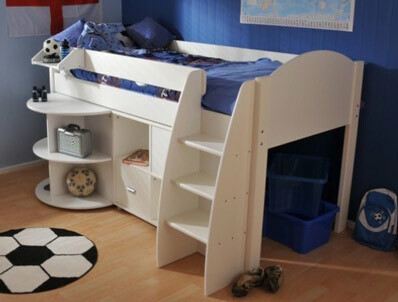 It is delivered flat packed for home self assembly or Stompa can now deliver and assemble your bed frame for £99. 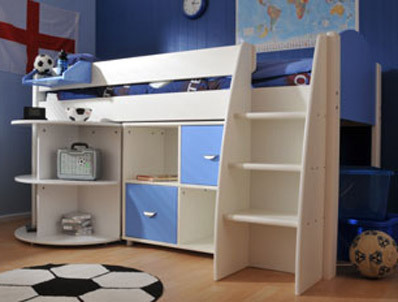 This package includes frame, ladder, pull out desk and a cubed storage unit with 2 doors. A Stompa mattress is available at an additional cost with a choice of coil or pocket spring available. A clip on shelf or an extra pair of doors can be added if required.